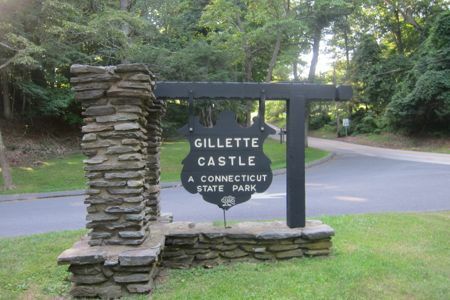 Note, I’ve written Several other Gillette Castle pages, including an updated hike through the park! If you are more than a casual reader of this website, you very most likely have been to Gillette Castle. It is, after all, probably one of the top 10 tourist attractions in the state. And deservedly so – William Gillette’s quirky, brilliant, beautiful home above the Connecticut River is really cool and worth more than one visit. 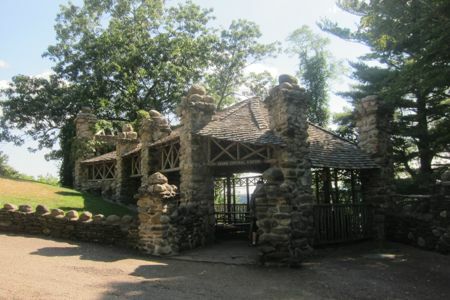 I had visited the castle twice before spending time hiking the trails around the state park. I don’t want you to wait so long – hiking here is an experience just as unique as touring Gillette’s castle. 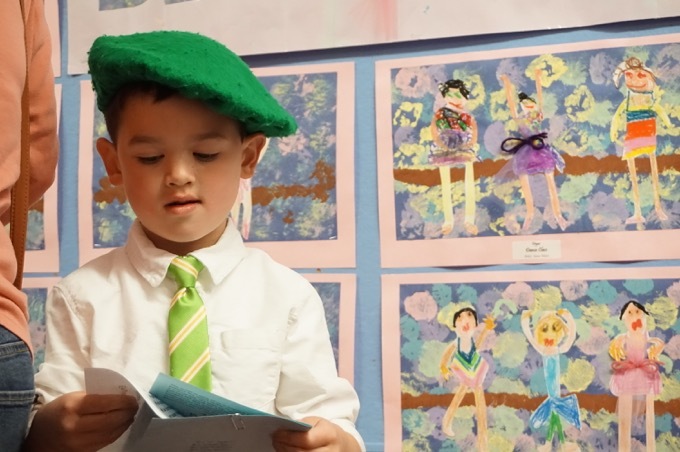 Calvin Coolidge Jr. was the only president who was born on the Fourth of July. Albert Einstein came up with the theory of relativity. Famed actress Helen Hayes was one of only nine people who have won an Emmy, a Grammy, an Oscar and a Tony Award. Yukio Ozaki, a mayor of Tokyo, brought the famed cherry trees to Washington, D.C.
That was from my friend Peter Marteka’s column on the Gillette Castle trails. 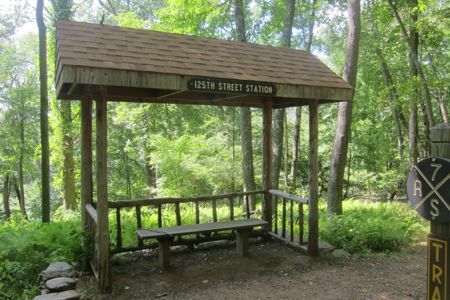 Today, the former 3-mile narrow gauge rail line is a network of hiking trails in the 184-acre state park. My in-laws decided to have a family picnic at the part one fine Sunday, so I decided that I’d hike the trails at the same time. In typical in-law fashion, they brought enough food to feed 100 people so the preparation would take a goodly while. 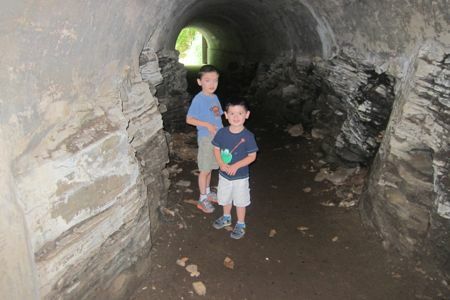 This afforded me time to take my two sons down the trail to check out the most interesting part of the trail network – the tunnel! Yes, Gillette actually built a real 75-foot tunnel through a hillside, on the train’s trip to the little switchyard. (Here is my page specifically about the tunnel.) 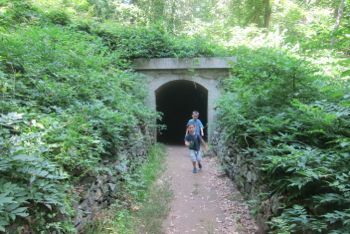 The tunnel is easily accessible from the picnic grounds next to the ponds and beautifully constructed bridges Gillette had built. As you can tell, the state park is beautiful in its own right. Of course, a visit to the castle is paramount at some point, but you can have just as much fun skipping that if you wish. 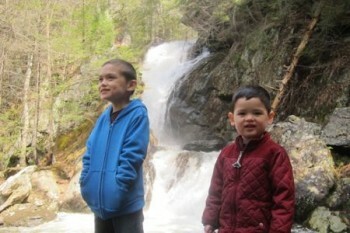 After round one of eating, I took both boys up to the castle and along some more trails. We first went into the (free!) visitor’s center which is small but really nice. The highlight is the restored engine that Gillette helmed, but there is also a little theater that shows a nice little movie on Gillette and his house. Also? 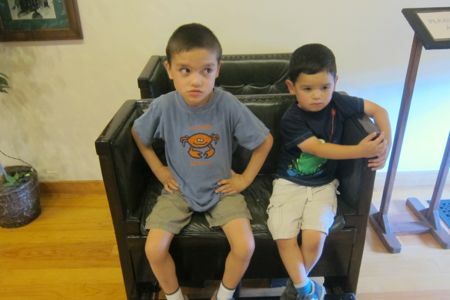 Original train car seats! The tracks and train engines, which pulled several cars, were sold to Lake Compounce in 1943 and used at America’s oldest continuously operated amusement park. The trains have since been returned to the state park, with the electric engine recently restored by the Friends of Gillette Castle. 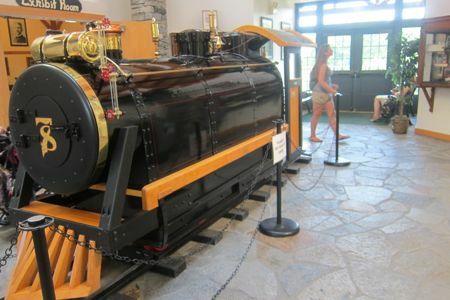 The engine sits in silent tribute, gleaming in the lobby of the park’s visitor center surrounded by photos of Gillette operating it. That’s why he gets paid to write and I don’t. [Gillette] had always been fascinated with trains, and all things mechanical, so in the mid-1920’s he began the construction of his private narrow-gauge railroad. in total, he laid over three miles of track including a tunnel, a swing bridge, two terminals, and several wooden and stone bridges. He had two train engines (one electric and one steam) and several passenger cars built at priest’s Garage in Chester, CT. The total cost of the railroad was close to $50,000. 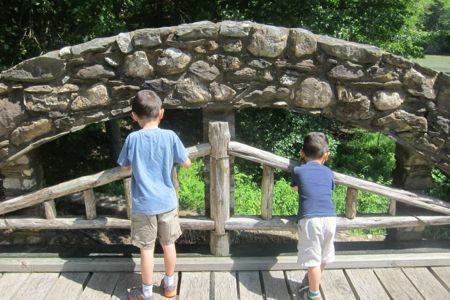 You can skip the castle for a day out in the park, but after visiting the little center next to the castle, at least walk around the grounds outside the crazy stone manse as I did with my boys. You cn’t help but notice a “train station.” This is what Gillette deemed “Grand Central Station” and its stonework and log beam construction is rather impressive. A section of the original track is kept here as well which is probably boring to most visitors, but having walked the entire route of the old tracks, I found it pretty cool. From there, the trail spreads out in all directions. There are several little bridges and a couple long tressles that were built for his little train. 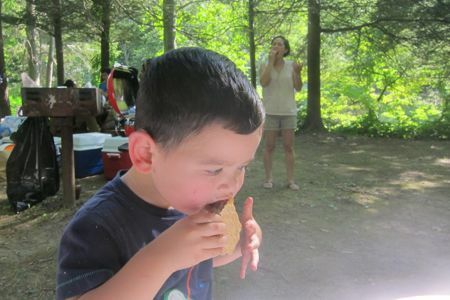 Don’t worry, Calvin and his mama got their s’mores. 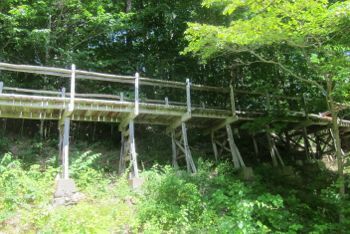 The trails of the park are fairly well-maintained and a good bit of the original masonry can be found throughout your hike if you are paying attention. The only regret I felt trudging around this whole place while my family did family things was that I never got to ride the little train with William Gillette. At least there’s this old-timey video of it in action!